What is that? A light at the end of the tunnel? It has been a productive January with more on the way. We got Ben a new psychiatrist and so far he seems more stable. We got preliminary approval for him to start ABA therapy with a new provider, and next week he has his long awaited appointment at Nationwide Children’s Hospital to see if there’s anything more we can do to manage his vomiting, which is actually under better control than it ever has been since his ﻿June hospitalization ﻿(with ample room left for improvement). It seems that everything is coming up roses. Many puzzle pieces long missing have turned up, and I am eager to get them into place. Eager with a side of consternation, that is. You see, Ben’s puzzle is a slippery bugger. Every time I catch a glimpse of real progress there’s a sinkhole forming over yonder that catches me by surprise by falling apart. After failing to thrive and getting his Hirschsprung’s diagnosis he had corrective surgery, and just when he started growing and progressing Cyclical Vomiting Syndrome came up. We got that managed and he did well and wound up with leukemia a year later. After 3.5 years of treatment the anticipation of improved health was palpable, but several surgeries, significant mental health and autism diagnosis, a massive medical side effect causing rapidly progressing Parkinsonism, then back to square one with mental health management, another surgery, and a revisit from CVS later, it’s becoming hard to believe that his puzzle will actually come together. As I wrote in a post called “Foreboding Joy“, it’s pretty difficult to avoid living like the other shoe is going to drop at any moment. I want to be excited, I want to hope, but experience is a good teacher, so I hold my breath. Still, I can’t help but wonder if maybe this time it will work. Maybe Ben will feel really good, get mental health and behavioral management, and finally be able to enjoy his life. Maybe we will finally enter a parenting stage where our role will somewhat resemble other parents rather than a combination of healthcare providers, caregivers and behavioral strategists. The notion is delicious beyond imagining. Little Ben has captured my whole heart. My love for him is 100% action verb. I adore the little stinker. I long to toss a few of my hats off and be just Ben’s momma (or maybe just shrink them and wear my big ole momma hat front and center, being realistic). But oh, my heart! To have my primary focus on Ben to be being momma! I can hardly stand it, my heart aches so hard for that! The story of parenting Ben is “Hope Deferred”, because our family is a tree of life that has inexplicably grown in spite of unfulfilled longing and heart sickness. This weekend Alex played with Ben. Happily, willingly. We laughed hard together and had normal family fun(despite momma feeling crummy). Normal family fun. Laughing together. I had almost forgotten what that was like. I want to remember. I want to live there instead of just visiting. In 2012 I started the year fasting and praying for wholeness, healing and health. We laid hands on Ben to ask for God to be with him in a tangible way. It wound up being the worst year in our rather dismal family history (Or darn close, depending on the criteria used, there are others that were startlingly craptastic as well, but ’12 took the candle for physical health). Maybe for the first time in a few years I see a light at the end of a tunnel. Dear Lord, please don’t let this one be a freight train. 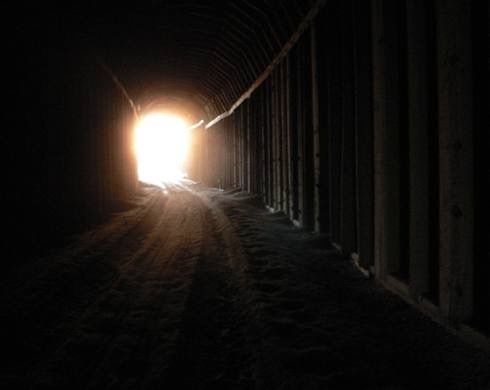 “Then it comes to be that the soothing light at the end of your tunnel. Is just a freight train coming your way.” ~Metallica, No Leaf Clover (aka the Mshar family theme song). Next Post What in the World Am I Supposed to do with This Snow Day? You’re amazing! This will be your year and Ben’s year!